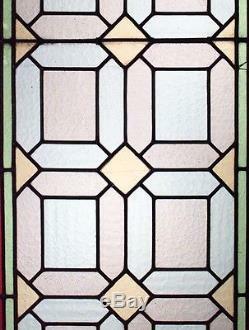 American Victorian Stained and Multicolored Leaded Glass Window Panels. 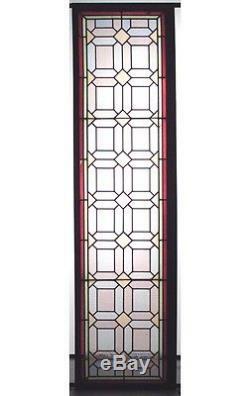 Inventory ID: 036732 4 American Victorian stained and multicolored leaded glass window panels with 16 square pink & blue panels in wood frame (PRICED EACH). Measurements: 20" wide x 78" high. For four generations, Newel has inspired international collectors and designers with one of the most extensive decorative and fine arts galleries in the world. A family business since 1939, our roots are firmly planted in New York, where we spent our earliest days furnishing some of Broadway's most fabled productions. Our current collection boasts over 10,000 extraordinary works from around the globe, with classic pieces dating from the 17th- to 21st-centuries, in addition to a trove of contemporary original designs and reproductions. In 2015, we celebrated a significant expansion, with our curated services now offered at two new locations: a 9000-square-foot gallery and showroom in Manhattan, and a 55,000-square-foot building in nearby Long Island City, the permanent home to our extended collection. We confirm that we either own the Work or are authorized to sell it on behalf of the owner. If you wish to rely on any variation of, or addition to, these terms and conditions, you must ensure that any such variation or addition has been agreed in writing by Newel. Any and all statements by us as to the authenticity, attribution, description, date, age, provenance, title, or condition of the work constitute our judgment and opinion only and are not warranted by Newel. We do not accept any liability as a result of any changes in expert opinion by Newel or any third party which may take place subsequent to the sale. This paragraph, however, shall not operate so as to exclude any liability on Newel's part for any fraudulent misrepresentation concerning the work. 2.2 Newel cannot warrant and is not authorized to certify UL Laboratory compliance for any item. 2.3 While we will on request explain the condition of the work, at the time of the sale and provide any information about condition for which you may reasonably ask, we will not be responsible for any subsequent deterioration of the work, however occasioned, after the sale. 2.4 You are responsible for satisfying yourself as to statements made by us as to the matters set out in paragraphs 2.1, 2.2 and 2.3 above. 4.2 From the time and date of agreed collection of the work from Newel, you will be responsible for the work and the risk of loss or damage shall pass to you. MISCELLANEOUS 7.1 These terms and conditions binds & inures to the benefit of the parties' assigns, successors, trustees, heirs, executors & administrators. Any proceedings or arbitrations arising hereunder shall be prosecuted in or before a court, panel or other adjudicatory body located in the County of New York. 7.4 The invalidity of any portion of these terms and conditions shall not effect the remainder of these terms and conditions. We are pleased to offer special pricing to trade buyers and private clients. You may also be interested in.. The item "American Victorian Stained and Multicolored Leaded Glass Window Panels" is in sale since Tuesday, October 25, 2016. This item is in the category "Antiques\Architectural & Garden\Stained Glass Windows". The seller is "newel1939" and is located in NY US, United States. This item can be shipped to United States.